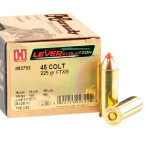 First introduced in 1872 to go with the Colt Single Action Army (SAA) revolver, the .45 Colt (also known as the ".45 Long Colt") was originally loaded with black powder. 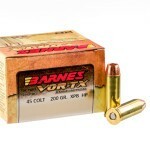 Today, in smokeless form, it is mostly used for target and cowboy action shooting. 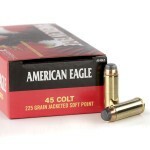 It can also be used for hunting and self-defense with the right loads. 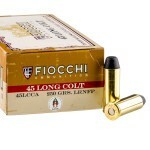 In addition to the classic SAA, many other firearms including the relatively new Taurus Judge and a wide variety of lever action long guns from Marlin, Henry, Rossi, and other manufacturers have been chambered to fire .45 Colt ammo. 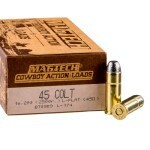 Cowboy action .45 Colt ammo is relatively light recoiling and easy to handle--a huge plus for rapid, accuracy oriented shooting. 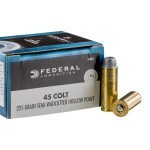 A typical round of .45 Long Colt ammo designed for action shooting fires a heavy bullet weighing 250 grains or more at a low muzzle velocity of 750 feet per second. 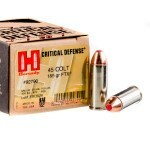 More powerful loads designed for hunting or defense usually fire a lighter bullet at muzzle velocities of around 900 to 1,000 feet per second, producing better terminal performance at the cost of greater recoil. 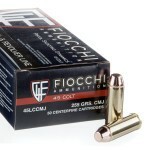 Such ammunition often uses modern jacketed hollow point bullets that greatly enhance expansion potential compared to the solid lead projectiles originally used with this caliber. 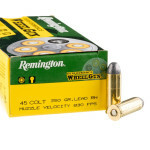 Owners of .454 Casull and .460 Magnum revolvers should note that .45 Colt ammunition can be fired in these guns safely (though the reverse is obviously not true). 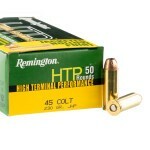 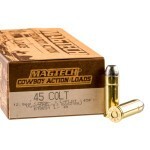 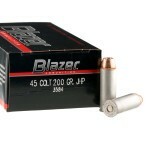 This is a great option for low cost target shooting, as .45 Colt ammo is considerably less expensive than magnum rounds.